Class 9 Science Chapter 11 Energy and Work NCERT Solution is given below. A force of 7 N acts on an object. The displacement is, say 8 m, in the direction of the force (Fig. 11.3). Let us take it that the force acts on the object through the displacement. What is the work done in this case? When do we say that work is done? (i) A force acts on the body. (ii) There is a displacement of the body caused by the applied force along the direction of the applied force. 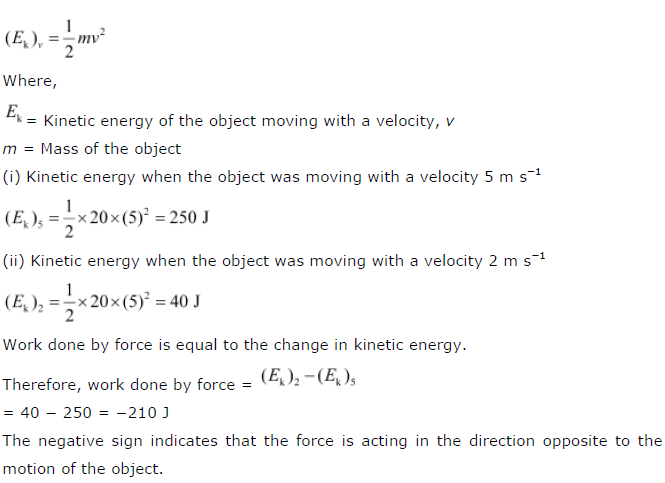 Write an expression for the work done when a force is acting on an object in the direction of its displacement. Define 1 J of work. 1 J is the amount of work done by a force of 1 N on an object that displaces it through a distance of 1 m in the direction of the applied force. A pair of bullocks exerts a force of 140 N on a plough. The field being ploughed is 15 m long. How much work is done in ploughing the length of the field? Hence, 2100 J of work is done in ploughing the length of the field. What is the kinetic energy of an object? Kinetic energy is the energy possessed by a body by the virtue of its motion. Every moving object possesses kinetic energy. A body uses kinetic energy to do work. Kinetic energy of hammer is used in driving a nail into a log of wood, kinetic energy of air is used to run wind mills, etc. Write an expression for the kinetic energy of an object. Its SI unit is Joule (J). The kinetic energy of an object of mass, m moving with a velocity of 5 m s-1 is 25 J. What will be its kinetic energy when its velocity is doubled? What will be its kinetic energy when its velocity is increased three times? (i) If the velocity of an object is doubled, then v = 5 × 2 = 10 m s-1. Therefore, its kinetic energy becomes 4 times its original value, because it is proportional to the square of the velocity. Hence, kinetic energy = 25 × 4 = 100 J. (ii) If velocity is increased three times, then its kinetic energy becomes 9 times its original value, because it is proportional to the square of the velocity. Hence, kinetic energy = 25 × 9 = 225 J. It is expressed in watt (W). A lamp consumes 1000 J of electrical energy in 10 s. What is its power? A body can do different amount of work in different time intervals. Hence, it is better to define average power. Average power is obtained by dividing the total amount of work done in the total time taken to do this work. Look at the activities listed below. Reason out whether or not work is done in the light of your understanding of the term ‘work’. Suma is swimming in a pond. A donkey is carrying a load on its back. A wind mill is lifting water from a well. A green plant is carrying out photosynthesis. An engine is pulling a train. Food grains are getting dried in the sun. A sailboat is moving due to wind energy. (ii) There is a displacement of the body by the application of force in or opposite to the direction of force. (a) While swimming, Suma applies a force to push the water backwards. Therefore, Suma swims in the forward direction caused by the forward reaction of water. Here, the force causes a displacement. Hence, work is done by Seema while swimming. (b) While carrying a load, the donkey has to apply a force in the upward direction. But, displacement of the load is in the forward direction. Since, displacement is perpendicular to force, the work done is zero. (c) A wind mill works against the gravitational force to lift water. Hence, work is done by the wind mill in lifting water from the well. (d) In this case, there is no displacement of the leaves of the plant. Therefore, the work done is zero. (e) An engine applies force to pull the train. This allows the train to move in the direction of force. Therefore, there is a displacement in the train in the same direction. Hence, work is done by the engine on the train. (f) Food grains do not move in the presence of solar energy. Hence, the work done is zero during the process of food grains getting dried in the Sun. (g)Wind energy applies a force on the sailboat to push it in the forward direction. Therefore, there is a displacement in the boat in the direction of force. Hence, work is done by wind on the boat. An object thrown at a certain angle to the ground moves in a curved path and falls back to the ground. The initial and the final points of the path of the object lie on the same horizontal line. What is the work done by the force of gravity on the object? Work done by the force of gravity on an object depends only on vertical displacement. Vertical displacement is given by the difference in the initial and final positions/heights of the object, which is zero. Therefore, the work done by gravity on the given object is zero joule. A battery lights a bulb. Describe the energy changes involved in the process. Certain force acting on a 20 kg mass changes its velocity from 5 m s-1 to 2 m s-1. Calculate the work done by the force. A mass of 10 kg is at a point A on a table. It is moved to a point B. If the line joining A and B is horizontal, what is the work done on the object by the gravitational force? Explain your answer. Hence, the work done by gravity on the body is zero. The potential energy of a freely falling object decreases progressively. Does this violate the law of conservation of energy? Why? No. The process does not violate the law of conservation of energy. This is because when the body falls from a height, then its potential energy changes into kinetic energy progressively. A decrease in the potential energy is equal to an increase in the kinetic energy of the body. During the process, total mechanical energy of the body remains conserved. Therefore, the law of conservation of energy is not violated. What are the various energy transformations that occur when you are riding a bicycle? During the transformation, the total energy remains conserved. Does the transfer of energy take place when you push a huge rock with all your might and fail to move it? Where is the energy you spend going? When we push a huge rock, there is no transfer of muscular energy to the stationary rock. Also, there is no loss of energy because muscular energy is transferred into heat energy, which causes our body to become hot. A certain household has consumed 250 units of energy during a month. How much energy is this in joules? If the direction of force is perpendicular to displacement, then the work done is zero. When a satellite moves around the Earth, then the direction of force of gravity on the satellite is perpendicular to its displacement. Hence, the work done on the satellite by the Earth is zero. Can there be displacement of an object in the absence of any force acting on it? Think. Discuss this question with your friends and teacher. Suppose an object is moving with constant velocity. The net force acting on it is zero. But, there is a displacement along the motion of the object. Hence, there can be a displacement without a force. A person holds a bundle of hay over his head for 30 minutes and gets tired. Has he done some work or not? Justify your answer. When a person holds a bundle of hay over his head, then there is no displacement in the bundle of hay. Although, force of gravity is acting on the bundle, the person is not applying any force on it. Hence, in the absence of force, work done by the person on the bundle is zero. An electric heater is rated 1500 W. How much energy does it use in 10 hours? Hence, the energy consumed by the heater in 10 h is 15 kWh. Illustrate the law of conservation of energy by discussing the energy changes which occur when we draw a pendulum bob to one side and allow it to oscillate. Why does the bob eventually come to rest? What happens to its energy eventually? Is it a violation of the law of conservation of energy? The law of conservation of energy states that energy can be neither created nor destroyed. It can only be converted from one form to another. Consider the case of an oscillating pendulum. 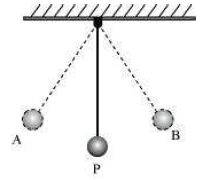 When a pendulum moves from its mean position P to either of its extreme positions A or B, it rises through a height h above the mean level P. At this point, the kinetic energy of the bob changes completely into potential energy. The kinetic energy becomes zero, and the bob possesses only potential energy. As it moves towards point P, its potential energy decreases progressively. Accordingly, the kinetic energy increases. As the bob reaches point P, its potential energy becomes zero and the bob possesses only kinetic energy. This process is repeated as long as the pendulum oscillates. The bob does not oscillate forever. It comes to rest because air resistance resists its motion. The pendulum loses its kinetic energy to overcome this friction and stops after some time. The law of conservation of energy is not violated because the energy lost by the pendulum to overcome friction is gained by its surroundings. Hence, the total energy of the pendulum and the surrounding system remain conserved. An object of mass, m is moving with a constant velocity, v. How much work should be done on the object in order to bring the object to rest? Hence, 20.8 × 104 J of work is required to stop the car. In each of the following a force, F is acting on an object of mass, m. The direction of displacement is from west to east shown by the longer arrow. Observe the diagrams carefully and state whether the work done by the force is negative, positive or zero. In this case, the direction of force acting on the block is perpendicular to the displacement. Therefore, work done by force on the block will be zero. In this case, the direction of force acting on the block is in the direction of displacement. Therefore, work done by force on the block will be positive. In this case, the direction of force acting on the block is opposite to the direction of displacement. Therefore, work done by force on the block will be negative. Soni says that the acceleration in an object could be zero even when several forces are acting on it. Do you agree with her? Why? Acceleration in an object could be zero even when several forces are acting on it. This happens when all the forces cancel out each other i.e., the net force acting on the object is zero. For a uniformly moving object, the net force acting on the object is zero. Hence, the acceleration of the object is zero. Hence, Soni is right. Find the energy in kW h consumed in 10 hours by four devices of power 500 W each. = 20 kWh = 20 Units. A freely falling object eventually stops on reaching the ground. What happens to its kinetic energy? NCERT Class 9th Solutions Science Chapter 11 Energy and Work. When an object falls freely towards the ground, its potential energy decreases and kinetic energy increases. As the object touches the ground, all its potential energy gets converted into kinetic energy. As the object hits the hard ground, all its kinetic energy gets converted into heat energy and sound energy. It can also deform the ground depending upon the nature of the ground and the amount of kinetic energy possessed by the object. Most of the energy used by the University of Utah campus comes from fossil fuel sources, such as coal and natural gas, making building energy use the primary contributor to the U’s carbon footprint. Building energy use accounts for three-quarters of the University’s greenhouse gas emissions. To reduce the U’s energy consumption, the Energy Management Office focuses on savings opportunities from occupant behavioral changes, energy efficiency upgrades, installation of renewable technologies, and more. If you are the last person in a room, even a bathroom or conference room, turn off the lights. When you leave your work station, turn off your computer, monitors, printers, etc. Use task lighting, such as desk lamps, instead of overhead lighting. NCERT Solutions for Class 10th Science Chapter 8 How Do Organisms Reproduce?